Unicode is a computing industry standard for the consistent encoding, representation and handling of text expressed in most of the world's writing systems. Developed in conjunction with the Universal Character Set standard and published as The Unicode Standard, the latest version of Unicode contains a repertoire of more than 110,000 characters covering 100 scripts and multiple symbol sets. The standard consists of a set of code charts for visual reference, an encoding method and set of standard character encodings, a set of reference data computer files, and a number of related items, such as character properties, rules for normalization, decomposition, collation, rendering, and bidirectional display order (for the correct display of text containing both right-to-left scripts, such as Arabic and Hebrew, and left-to-right scripts). As of June 2014, the most recent version is Unicode 7.0. The standard is maintained by the Unicode Consortium. Unicode's success at unifying character sets has led to its widespread and predominant use in the internationalization and localization of computer software. The standard has been implemented in many recent technologies, including modern operating systems, XML, the Java programming language, and the Microsoft .NET Framework. Unicode can be implemented by different character encodings. The most commonly used encodings are UTF-8, UTF-16 and the now-obsolete UCS-2. UTF-8 uses one byte for any ASCII character, all of which have the same code values in both UTF-8 and ASCII encoding, and up to four bytes for other characters. UCS-2 uses a 16-bit code unit (two 8-bit bytes) for each character but cannot encode every character in the current Unicode standard. UTF-16 extends UCS-2, using one 16-bit unit for the characters that were representable in UCS-2 and two 16-bit units (4 × 8 bit) to handle each of the additional characters. The first 256 code points were made identical to the content of ISO-8859-1 so as to make it trivial to convert existing western text. Many essentially identical characters were encoded multiple times at different code points to preserve distinctions used by legacy encodings and therefore, allow conversion from those encodings to Unicode (and back) without losing any information. For example, the "fullwidth forms" section of code points encompasses a full Latin alphabet that is separate from the main Latin alphabet section. In Chinese, Japanese, and Korean (CJK) fonts, these characters are rendered at the same width as CJK ideographs, rather than at half the width. For other examples, see Duplicate characters in Unicode. The origins of Unicode date to 1987, when Joe Becker from Xerox and Lee Collins and Mark Davis from Apple started investigating the practicalities of creating a universal character set. In August 1988, Joe Becker published a draft proposal for an "international/multilingual text character encoding system, tentatively called Unicode". He explained that "[t]he name 'Unicode' is intended to suggest a unique, unified, universal encoding". In early 1989, the Unicode working group expanded to include Ken Whistler and Mike Kernaghan of Metaphor, Karen Smith-Yoshimura and Joan Aliprand of RLG, and Glenn Wright of Sun Microsystems, and in 1990 Michel Suignard and Asmus Freytag from Microsoft and Rick McGowan of NeXT joined the group. By the end of 1990, most of the work on mapping existing character encoding standards had been completed, and a final review draft of Unicode was ready. The Unicode Consortium was incorporated on January 3, 1991, in California, and in October 1991, the first volume of the Unicode standard was published. The second volume, covering Han ideographs, was published in June 1992. In 1996, a surrogate character mechanism was implemented in Unicode 2.0, so that Unicode was no longer restricted to 16 bits. This increased the Unicode codespace to over a million code points, which allowed for the encoding of many historic scripts (e.g. Egyptian Hieroglyphs) and thousands of rarely used or obsolete characters that had not been anticipated as needing encoding. Among the characters not originally intended for Unicode are rarely used Kanji or Chinese characters, many of which are part of personal and place names, making them rarely used, but much more essential than envisioned in the original architecture of Unicode. Unicode defines a codespace of 1,114,112 code points in the range 0hex to 10FFFFhex. Normally a Unicode code point is referred to by writing "U+" followed by its hexadecimal number. For code points in the Basic Multilingual Plane (BMP), four digits are used (e.g. U+0058 for the character LATIN CAPITAL LETTER X); for code points outside the BMP, five or six digits are used, as required (e.g. U+E0001 for the character LANGUAGE TAG and U+10FFFD for the character PRIVATE USE CHARACTER-10FFFD). Older versions of the standard used similar notations but with slightly different rules. For example, Unicode 3.0 used "U-" followed by eight digits to indicate a code point, and allowed "U+" to be used only with exactly four digits to indicate a code unit, such as a single byte of a multibyte UTF-8 encoding of a code point. ^ a b Stability policy: Property Value Stability and table. Stability policy: Some gc groups will never change. gc=Nd corresponds with Numeric Type=De (decimal). ^ a b c d e Unicode 6.0, Chapter 4, table 4-12 Name=""; a Code Point Label may be used to identify a nameless code point. E.g. hhhh>, . The Name remains blank, which can prevent inadvertently replacing, in documentation, a Control Name with a true Control code. Unicode also uses for . Code points in the range U+D800..U+DBFF (1,024 code points) are known as high-surrogate code points, and code points in the range U+DC00..U+DFFF (1,024 code points) are known as low-surrogate code points. A high-surrogate code point (also known as a leading surrogate) followed by a low-surrogate code point (also known as a trailing surrogate) together form a surrogate pair used in UTF-16 to represent 1,048,576 code points outside BMP. High and low surrogate code points are not valid by themselves. Thus the range of code points that are available for use as characters is U+0000..U+D7FF and U+E000..U+10FFFF (1,112,064 code points). The value of these code points (i.e. excluding surrogates) is sometimes referred to as the character's scalar value. Certain noncharacter code points are guaranteed never to be used for encoding characters, although applications may make use of these code points internally if they wish. There are sixty-six noncharacters: U+FDD0..U+FDEF and any code point ending in the value FFFE or FFFF (i.e. U+FFFE, U+FFFF, U+1FFFE, U+1FFFF, ... U+10FFFE, U+10FFFF). The set of noncharacters is stable, and no new noncharacters will ever be defined. Reserved code points are those code points which are available for use as encoded characters, but are not yet defined as characters by Unicode. Supplementary Private Use Area-B: U+100000..U+10FFFD (65,534 characters). Graphic characters are characters defined by Unicode to have a particular semantic, and either have a visible glyph shape or represent a visible space. As of Unicode 7.0 there are 112,804 graphic characters. Format characters are characters that do not have a visible appearance, but may have an effect on the appearance or behavior of neighboring characters. For example, U+200C zero-width non-joiner and U+200D zero-width joiner may be used to change the default shaping behavior of adjacent characters (e.g. to inhibit ligatures or request ligature formation). There are 152 format characters in Unicode 7.0. Sixty-five code points (U+0000..U+001F and U+007F.. U+009F) are reserved as control codes, and correspond to the C0 and C1 control codes defined in ISO/IEC 6429. Of these U+0009 (Tab), U+000A (Line Feed), and U+000D (Carriage Return) are widely used in Unicode-encoded texts. Graphic characters, format characters, control code characters, and private use characters are known collectively as assigned characters. The Unicode Consortium is a nonprofit organization that coordinates Unicode's development. Full members include most of the main computer software and hardware companies with any interest in text-processing standards, including Adobe Systems, Apple, Google, IBM, Microsoft, Oracle Corporation, Yahoo! and the Ministry of Endowments and Religious Affairs of Sultanate of Oman. 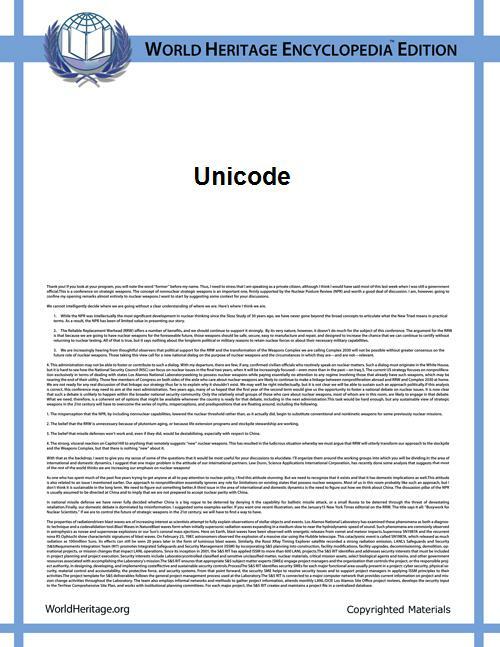 Unicode is developed in conjunction with the ISO/IEC 10646: the Universal Character Set. Unicode and ISO/IEC 10646 function equivalently as character encodings, but The Unicode Standard contains much more information for implementers, covering—in depth—topics such as bitwise encoding, collation and rendering. The Unicode Standard enumerates a multitude of character properties, including those needed for supporting bidirectional text. The two standards do use slightly different terminology. The Consortium first published The Unicode Standard (ISBN 0-321-18578-1) in 1991 and continues to develop standards based on that original work. The latest version of the standard, Unicode 7.0, was released in June 2014 and is available from the consortium's web site. The last of the major versions (versions x.0) to be published in book form was Unicode 5.0 (ISBN 0-321-48091-0), but since Unicode 6.0 the full text of the standard is no longer being published in book form. In 2012, however, it was announced that only the core specification for Unicode version 6.1 would be made available as a 692 page print-on-demand paperback. Unlike the previous major version printings of the Standard, the print-on-demand core specification does not include any code charts or standard annexes, but the entire standard, including the core specification, will still remain freely available on the Unicode website. Thus far the following major and minor versions of the Unicode standard have been published. Update versions, which do not include any changes to character repertoire, are signified by the third number (e.g. "version 4.0.1") and are omitted in the table below. 1.0.0 October 1991 ISBN 0-201-56788-1 (Vol.1) 24 7,161 Initial repertoire covers these scripts: Greek and Coptic, Gujarati, Gurmukhi, Hangul, Hebrew, Hiragana, Kannada, Katakana, Lao, Latin, Malayalam, Oriya, Tamil, Telugu, Thai, and Tibetan. 1.0.1 June 1992 ISBN 0-201-60845-6 (Vol.2) 25 28,359 The initial set of 20,902 CJK Unified Ideographs is defined. 2.1 May 1998 ISO/IEC 10646-1:1993 plus Amendments 5, 6 and 7, as well as two characters from Amendment 18 25 38,952 Euro sign added. 5.2 October 2009 ISO/IEC 10646:2003 plus Amendments 1, 2, 3, 4, 5 and 6 90 107,361 Avestan, Bamum, Egyptian hieroglyphs (the Gardiner Set, comprising 1,071 characters), Imperial Aramaic, Inscriptional Pahlavi, Inscriptional Parthian, Javanese, Kaithi, Lisu, Meetei Mayek, Old South Arabian, Old Turkic, Samaritan, Tai Tham and Tai Viet added. 4,149 additional CJK Unified Ideographs (CJK-C), as well as extended Jamo for Old Hangul, and characters for Vedic Sanskrit. 6.0 October 2010 ISO/IEC 10646:2010 plus the Indian rupee sign 93 109,449 Batak, Brahmi, Mandaic, playing card symbols, transport and map symbols, alchemical symbols, emoticons and emoji. 222 additional CJK Unified Ideographs (CJK-D) added. 6.1 January 2012 ISO/IEC 10646:2012 100 110,181 Chakma, Meroitic cursive, Meroitic hieroglyphs, Miao, Sharada, Sora Sompeng, and Takri. 6.2 September 2012 ISO/IEC 10646:2012 plus the Turkish lira sign 100 110,182 Turkish lira sign. 6.3 September 2013 ISO/IEC 10646:2012 plus six characters 100 110,187 5 bidirectional formatting characters. 7.0 June 2014 ISO/IEC 10646:2012 plus Amendments 1 and 2, as well as the Ruble sign 123 113,021 Bassa Vah, Caucasian Albanian, Duployan, Elbasan, Grantha, Khojki, Khudawadi, Linear A, Mahajani, Manichaean, Mende Kikakui, Modi, Mro, Nabataean, Old North Arabian, Old Permic, Pahawh Hmong, Palmyrene, Pau Cin Hau, Psalter Pahlavi, Siddham, Tirhuta, Warang Citi, and Dingbats. The next version of the Unicode standard is planned as version 8.0, due to be released in June 2015, and new versions are scheduled for release each June thereafter. Many modern applications can render a substantial subset of the many OpenOffice.org application. Unicode covers almost all scripts (writing systems) in current use today. A total of 123 scripts are included in the latest version of Unicode (covering alphabets, abugidas and syllabaries), although there are still scripts that are not yet encoded, particularly those mainly used in historical, liturgical, and academic contexts. Further additions of characters to the already encoded scripts, as well as symbols, in particular for mathematics and music (in the form of notes and rhythmic symbols), also occur. The Unicode Roadmap Committee (Michael Everson, Rick McGowan, and Ken Whistler) maintain the list of scripts that are candidates or potential candidates for encoding and their tentative code block assignments on the Unicode Roadmap page of the Unicode Consortium Web site. For some scripts on the Roadmap, such as Jurchen, Nü Shu, and Tangut, encoding proposals have been made and they are working their way through the approval process. For others scripts, such as Mayan and Rongorongo, no proposal has yet been made, and they await agreement on character repertoire and other details from the user communities involved. Unicode defines two mapping methods: the Unicode Transformation Format (UTF) encodings, and the Universal Character Set (UCS) encodings. An encoding maps (possibly a subset of) the range of Unicode code points to sequences of values in some fixed-size range, termed code values. The numbers in the names of the encodings indicate the number of bits in one code value (for UTF encodings) or the number of bytes per code value (for UCS) encodings. UTF-8 and UTF-16 are probably the most commonly used encodings. UCS-2 is an obsolete subset of UTF-16; UCS-4 and UTF-32 are functionally equivalent. UTF-8 – an 8-bit variable-width encoding which maximizes compatibility with ASCII. Punycode, another encoding form, enables the encoding of Unicode strings into the limited character set supported by the ASCII-based Domain Name System. The encoding is used as part of IDNA, which is a system enabling the use of Internationalized Domain Names in all scripts that are supported by Unicode. Earlier and now historical proposals include UTF-5 and UTF-6. Unicode includes a mechanism for modifying character shape that greatly extends the supported glyph repertoire. This covers the use of combining diacritical marks. They are inserted after the main character. Multiple combining diacritics may be stacked over the same character. Unicode also contains precomposed versions of most letter/diacritic combinations in normal use. These make conversion to and from legacy encodings simpler, and allow applications to use Unicode as an internal text format without having to implement combining characters. For example é can be represented in Unicode as U+0065 (LATIN SMALL LETTER E) followed by U+0301 (COMBINING ACUTE ACCENT), but it can also be represented as the precomposed character U+00E9 (LATIN SMALL LETTER E WITH ACUTE). Thus, in many cases, users have multiple ways of encoding the same character. To deal with this, Unicode provides the mechanism of canonical equivalence. The CJK ideographs currently have codes only for their precomposed form. Still, most of those ideographs comprise simpler elements (often called radicals in English), so in principle, Unicode could have decomposed them, as it did with Hangul. This would have greatly reduced the number of required code points, while allowing the display of virtually every conceivable ideograph (which might do away with some of the problems caused by the Han unification). A similar idea covers some input methods, such as Cangjie and Wubi. However, attempts to do this for character encoding have stumbled over the fact that ideographs do not decompose as simply or as regularly as it seems they should. This process is different from a formal encoding of an ideograph. There is no canonical description of unencoded ideographs; there is no semantic assigned to described ideographs; there is no equivalence defined for described ideographs. Conceptually, ideographic descriptions are more akin to the English phrase "an 'e' with an acute accent on it" than to the character sequence . Several subsets of Unicode are standardized: Microsoft Windows since Windows NT 4.0 supports WGL-4 with 652 characters, which is considered to support all contemporary European languages using the Latin, Greek, or Cyrillic script. Other standardized subsets of Unicode include the Multilingual European Subsets: MES-1 (Latin scripts only, 335 characters), MES-2 (Latin, Greek and Cyrillic 1062 characters) and MES-3A & MES-3B (two larger subsets, not shown here). Note that MES-2 includes every character in MES-1 and WGL-4. Rendering software which cannot process a Unicode character appropriately often displays it as an open rectangle, or the Unicode "replacement character" (U+FFFD, �), to indicate the position of the unrecognized character. Some systems have made attempts to provide more information about such characters. The Apple LastResort font will display a substitute glyph indicating the Unicode range of the character, and the SIL Unicode fallback font will display a box showing the hexadecimal scalar value of the character. Unicode has become the dominant scheme for internal processing and storage of text. Although a great deal of text is still stored in legacy encodings, Unicode is used almost exclusively for building new information processing systems. Early adopters tended to use UCS-2 and later moved to UTF-16 (as this was the least disruptive way to add support for non-BMP characters). The best known such system is Windows NT (and its descendants, Windows 2000, Windows XP, Windows Vista and Windows 7), which uses UTF-16 as the sole internal character encoding. The Java and .NET bytecode environments, Mac OS X, and KDE also use it for internal representation. Unicode is available on Windows 95 (and its descendants, Windows 98 and Windows ME) through Microsoft Layer for Unicode. Multilingual text-rendering engines which use Unicode include Uniscribe and DirectWrite for Microsoft Windows, ATSUI and Core Text for Mac OS X, and Pango for GTK+ and the GNOME desktop. ISO 14755, which standardises methods for entering Unicode characters from their codepoints, specifies several methods. There is the Basic method, where a beginning sequence is followed by the hexadecimal representation of the codepoint and the ending sequence. There is also a screen-selection entry method specified, where the characters are listed in a table in a screen, such as with a character map program. MIME defines two different mechanisms for encoding non-ASCII characters in email, depending on whether the characters are in email headers (such as the "Subject:"), or in the text body of the message; in both cases, the original character set is identified as well as a transfer encoding. For email transmission of Unicode the UTF-8 character set and the Base64 or the Quoted-printable transfer encoding are recommended, depending on whether much of the message consists of ASCII-characters. The details of the two different mechanisms are specified in the MIME standards and generally are hidden from users of email software. The adoption of Unicode in email has been very slow. Some East-Asian text is still encoded in encodings such as ISO-2022, and some devices, such as mobile phones, still cannot handle Unicode data correctly. Support has been improving however. Many major free mail providers such as Yahoo, Google (Gmail), and Microsoft (Outlook.com) support it. All W3C recommendations have used Unicode as their document character set since HTML 4.0. Web browsers have supported Unicode, especially UTF-8, for many years. Display problems result primarily from font related issues; in particular, versions of Microsoft Internet Explorer do not render many code points unless explicitly told to use a font that contains them. HTML characters manifest either directly as bytes according to document's encoding, if the encoding supports them, or users may write them as numeric character references based on the character's Unicode code point. For example, the references Δ, Й, ק, م, ๗, あ, 叶, 葉, and 말 (or the same numeric values expressed in hexadecimal, with &#x as the prefix) should display on all browsers as Δ, Й, ק, م, ๗, あ, 叶, 葉, and 말. Free and retail fonts based on Unicode are widely available, since TrueType and OpenType support Unicode. These font formats map Unicode code points to glyphs. Thousands of fonts exist on the market, but fewer than a dozen fonts—sometimes described as "pan-Unicode" fonts—attempt to support the majority of Unicode's character repertoire. Instead, Unicode-based fonts typically focus on supporting only basic ASCII and particular scripts or sets of characters or symbols. Several reasons justify this approach: applications and documents rarely need to render characters from more than one or two writing systems; fonts tend to demand resources in computing environments; and operating systems and applications show increasing intelligence in regard to obtaining glyph information from separate font files as needed, i.e. font substitution. Furthermore, designing a consistent set of rendering instructions for tens of thousands of glyphs constitutes a monumental task; such a venture passes the point of diminishing returns for most typefaces. Unicode partially addresses the new line problem that occurs when trying to read a text file on different platforms. Unicode defines a large number of characters that conforming applications should recognize as line terminators. In terms of the new line, Unicode introduced U+2028 line separator and U+2029 paragraph separator. This was an attempt to provide a Unicode solution to encoding paragraphs and lines semantically, potentially replacing all of the various platform solutions. In doing so, Unicode does provide a way around the historical platform dependent solutions. Nonetheless, few if any Unicode solutions have adopted these Unicode line and paragraph separators as the sole canonical line ending characters. However, a common approach to solving this issue is through new line normalization. This is achieved with the Cocoa text system in Mac OS X and also with W3C XML and HTML recommendations. In this approach every possible new line character is converted internally to a common new line (which one does not really matter since it is an internal operation just for rendering). In other words, the text system can correctly treat the character as a new line, regardless of the input's actual encoding. Unicode has been criticized for failing to separately encode older and alternative forms of kanji which, critics argue, complicates the processing of ancient Japanese and uncommon Japanese names. This is often due to the fact that Unicode encodes characters rather than glyphs (the visual representations of the basic character that often vary from one language to another). Unification of glyphs leads to the perception that the languages themselves, not just the basic character representation, are being merged. There have been several attempts to create alternative encodings that preserve the stylistic differences between Chinese, Japanese, and Korean characters in opposition to Unicode's policy of Han unification. An example of one is TRON (although it is not widely adopted in Japan, there are some users who need to handle historical Japanese text and favor it). Although the repertoire of fewer than 21,000 Han characters in the earliest version of Unicode was largely limited to characters in common modern usage, Unicode now includes more than 70,000 Han characters, and work is continuing to add thousands more historic and dialectal characters used in China, Japan, Korea, Taiwan, and Vietnam. 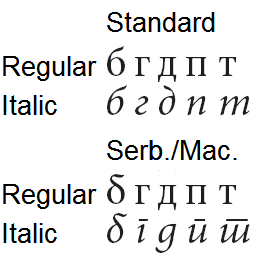 If the difference in the appropriate glyphs for two characters in the same script differ only in the italic, Unicode has generally unified them, as can be seen in the comparison between Russian (labeled standard) and Serbian characters at right, meaning that the difference had shown through smart font technology or manually changing fonts. Unicode was designed to provide code-point-by-code-point round-trip format conversion to and from any preexisting character encodings, so that text files in older character sets can be naïvely converted to Unicode, and then back and get back the same file. That has meant that inconsistent legacy architectures, such as combining diacritics and precomposed characters, both exist in Unicode, giving more than one method of representing some text. This is most pronounced in the three different encoding forms for Korean Hangul. Since version 3.0, any precomposed characters that can be represented by a combining sequence of already existing characters can no longer be added to the standard in order to preserve interoperability between software using different versions of Unicode. Indic scripts such as Tamil and Devanagari are each allocated only 128 code points, matching the ISCII standard. The correct rendering of Unicode Indic text requires transforming the stored logical order characters into visual order and the forming of ligatures (aka conjuncts) out of components. Some local scholars argued in favor of assignments of Unicode codepoints to these ligatures, going against the practice for other writing systems, though Unicode contains some Arabic and other ligatures for backward compatibility purposes only. Encoding of any new ligatures in Unicode will not happen, in part because the set of ligatures is font-dependent, and Unicode is an encoding independent of font variations. The same kind of issue arose for Tibetan script (the Chinese National Standard organization failed to achieve a similar change). Thai alphabet support has been criticized for its ordering of Thai characters. The vowels เ, แ, โ, ใ, ไ that are written to the left of the preceding consonant are in visual order instead of phonetic order, unlike the Unicode representations of other Indic scripts. This complication is due to Unicode inheriting the Thai Industrial Standard 620, which worked in the same way, and was the way in which Thai had always been written on keyboards. This ordering problem complicates the Unicode collation process slightly, requiring table lookups to reorder Thai characters for collation. Even if Unicode had adopted encoding according to spoken order, it would still be problematic to collate words in dictionary order. E.g. the word แสดง "perform" starts with a consonant cluster "สด" (with an inherent vowel for the consonant "ส"), the vowel แ-, in spoken order would come after the ด, but in a dictionary, the word is collated as it is written, with the vowel following the ส. ^ The number of characters listed for each version of Unicode is the total number of graphic, format and control characters (i.e. excluding private-use characters, noncharacters and surrogate code points). ^ a b c Becker, Joseph D. (August 29, 1988). "Unicode 88". ^ "The Unicode Standard, Version 6.0, p. 62, Character Encoding Forms". Retrieved 2012-06-04. ^ "Characters by Unicode General Category". 2011. Retrieved 2012-01-25. ^ "The Unicode Consortium Members". Retrieved 2010-03-16. ^ "Enumerated Versions of The Unicode Standard". Retrieved 2010-03-16. ^ "Unicode Data". Retrieved 2010-03-16. ^ Unicode Consortium (20 August 2014). "New Publication Schedule for The Unicode Standard". Retrieved 2014-08-20. ^ "About The Script Encoding Initiative". Unicode.org. Retrieved 2012-06-04. ^ The Unicode Standard, Version 6.2. The Unicode Consortium. 2013. p. 561. ^ Wood, Alan. "Setting up Windows Internet Explorer 5, 5.5 and 6 for Multilingual and Unicode Support". Alanwood.net. Retrieved 2012-06-04. ^ "Arabic Presentation Forms-A". Retrieved 2010-03-20. ^ "Arabic Presentation Forms-B". Retrieved 2010-03-20. ^ "Alphabetic Presentation Forms". Retrieved 2010-03-20. Alan Wood's Unicode Resources Contains lists of word processors with Unicode capability; fonts and characters are grouped by type; characters are presented in lists, not grids. Unicode-Table.com, a way to browse all glyphs of the Unicode standard visually. UnicodeTable.org, another way to browse the Unicode character set. Shapecatcher A HTML5 tool to find Unicode characters by drawing them (10877 characters indexed).